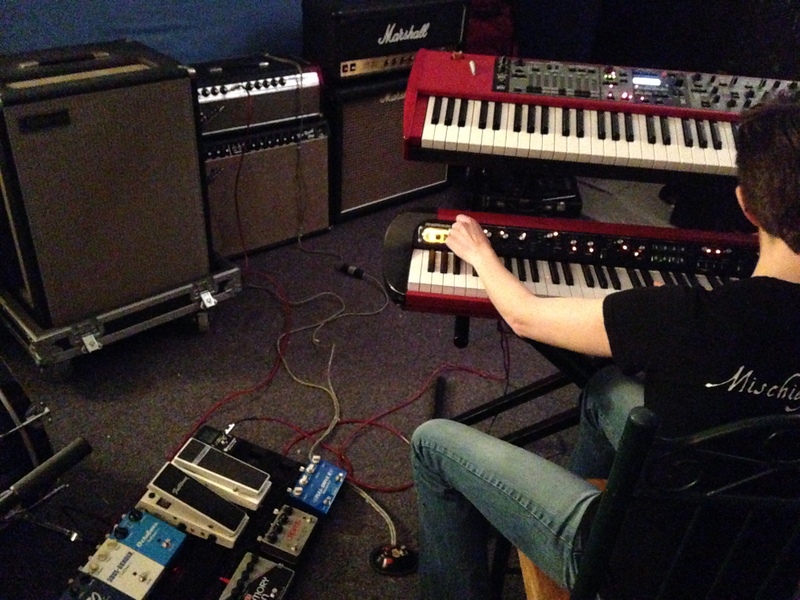 So while much of the rest of the world were tuning into Super Bowl XLVIII (and enjoying its Mar-velous music and military-honoring pregame and halftime pageants), I was holed up in a practice room in Takoma Park with two keyboards, four amps, and more effects pedals than I actually remember. Plugging my synth, organ, and Wurlitzer sounds through a pedal board into vintage amps finally happened this past Sunday in a long-anticipated exploration session planned with my Banana Phone bandmate, friend, and guitarist and guitar tech extraordinaire, Josh Shepard (who’s also in Ra Ra Rasputin). I’m not going to spend too much time trying to describe the results because we have some audio and video from the session. However, as a pianist who takes native sound for granted and has never really experimented with amps and effects, the new world that this opens is extremely exciting. When we jacked up the volumes and toggled the real rotor switch from low to high, I felt like the Seahawks and all their fans. Inspired by these initial concepts, we’re definitely getting back to the DC Arts Studio, recording gear in hand, to turn these fragments from soundscapes into actual songs. This third one contains a few huge mistakes, but I’m sharing it anyway because 1. I’m human, and 2. it’s an organ through a Leslie 18; even the crappy parts sound so lush and swimming.